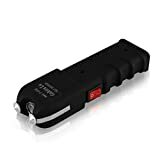 Will take on new meaning when you zap someone with one of these top 10 best stun guns in 2019. Technology has upgraded the stun gun and made protecting yourself a lot easier. You no longer have to be a helpless victim anymore. You can go out knowing you have a chance to strike back at your attacker. It is not called terminator for anything. 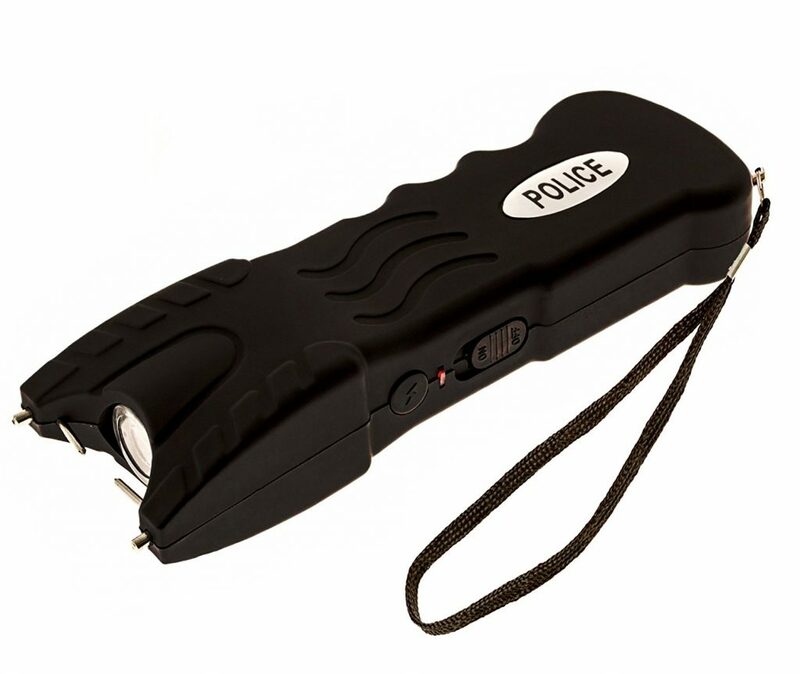 This powerful stun gun will practically incapacitate your attacker. They will be feeling the effects of the powerful electrical stun gun for about 10 minutes. It is easy to switch on and use. You just need to recharge it every 5 months. A 5-second blast is all you need to help you get away from your attacker. 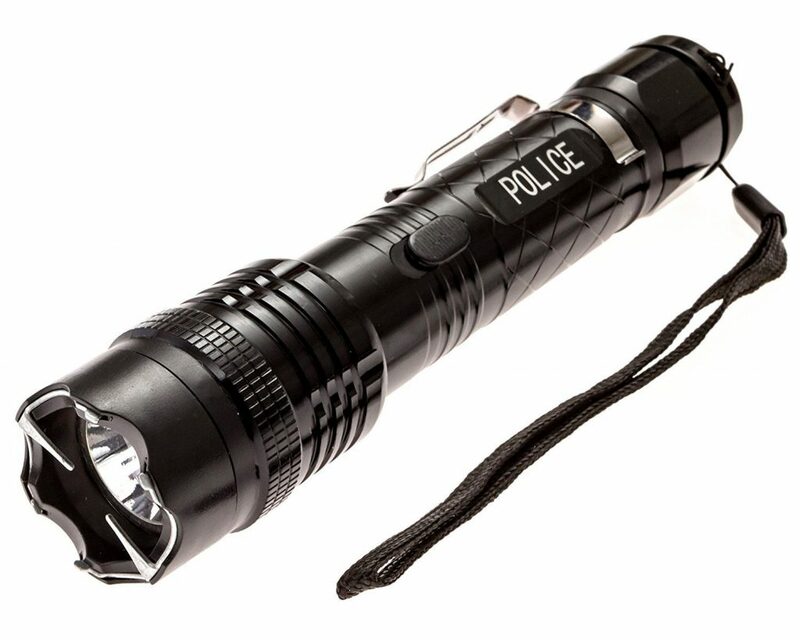 Its bright LED light will light your way home or blind your attacker. 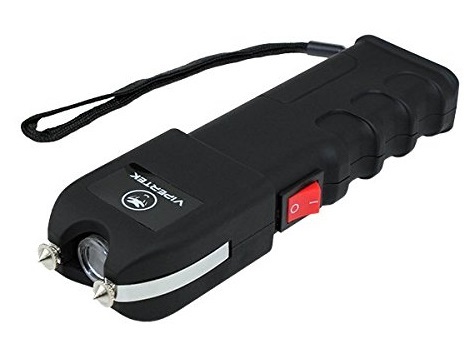 You get 680,000 volts of protection from this 6.5″ x 2″ x 1″ stun gun. But don’t worry, there is a safety switch to protect yourself from accidental discharge. 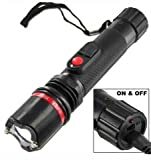 The electrical charge will not work when you use the flashlight. 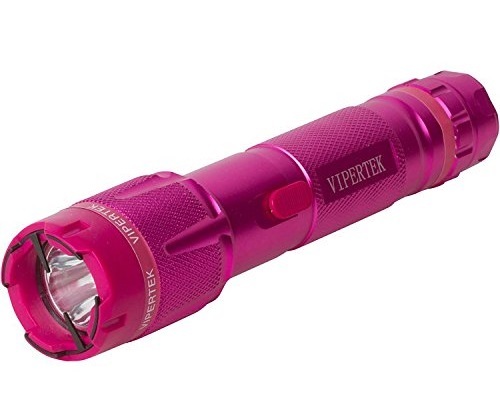 But you still can use the flashlight to blind your attacker. It will take about 6 to 8 hours to charge the battery but do not overcharge it. You may ruin the battery if you do. This 6.5″ x 2″ x 1″ stun gun will fit in your purse with ease and comes with a lifetime warranty. You get roughly 999,000 volts of electrical protection at your fingertips. Once nice feature is its disable function. If your attacker takes the gun away from you, the pin will pull out and stop the stun gun from being used on you. 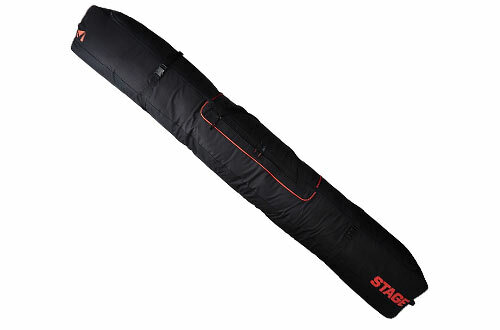 The no-slip rubber coating keeps the stun gun in your hands. 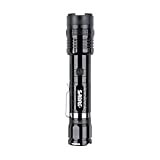 You get a powerful and very bright LED flashlight as well as a 95 dB alarm with this 5 x 2.5 x 9.5” stun gun. Plus, the 30,000 votes of electrical power will slow down almost any attacker. 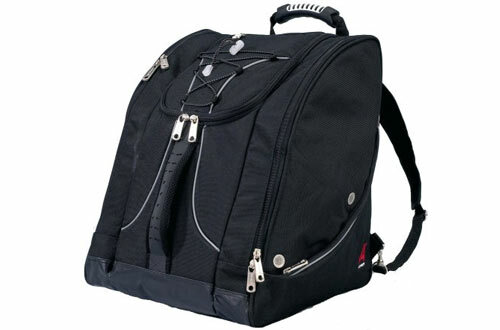 You also get a belt clip and holster, so you do not have to fumble through your purse to find it. 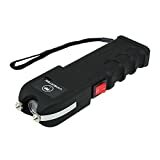 The aluminum made stun gun also has a safety switch to protect you from hurting yourself. 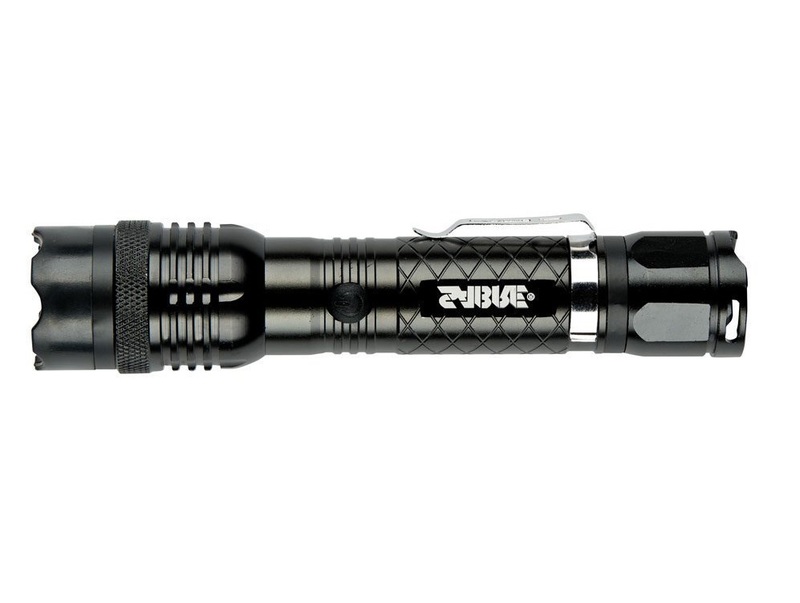 This 3 x 1.2 x 4 stun gun may look like a zebra, but it puts out a lot of protection. With a touch of a button, you can zap him with 18,000 volts of electricity or send a warning alarm. 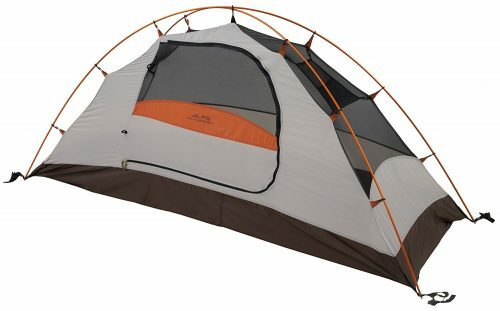 Plus, the built-in flashlight will help light your way home. All of this is powered by a built-in battery. The battery recharges by plugging the gun into any standard wall outlet. A holster will keep it by your side. The claim says 6,000,000 volts of power but that is an exaggeration. You do get enough power to stop or slow down your attacker though. Its loud sound will attract the attention of people passing by. You have your protection at your thumb tip. A simple on-off switch protects you and a safety cap protects the stun gun prongs. 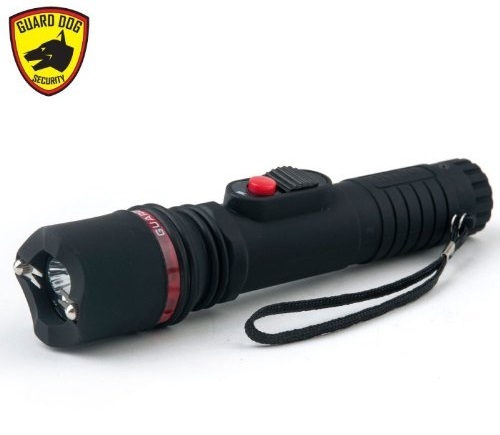 The rubberized grip keeps the stun gun from slipping out of your hand. 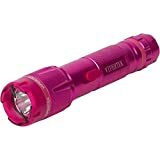 Plus, the 200-lumen flashlight will light up the scene. The 100,000-hour bulb casts a 350-lumen beam to light your way home. This accompanies the 20,000 actual volts of electricity the stun gun produces. Your thumb turns the 6 ¾” stun gun on and it is ready to use for any serious altercation. 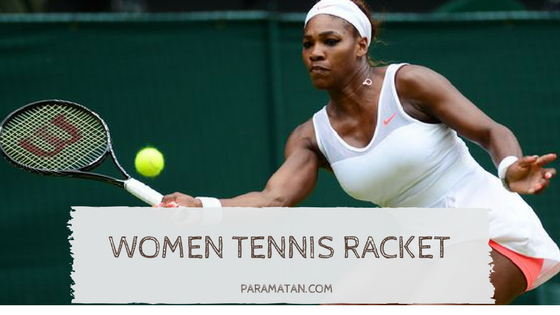 It is all powered by a built-in rechargeable battery. The aluminum constructed stun gun comes with a lifetime warranty. 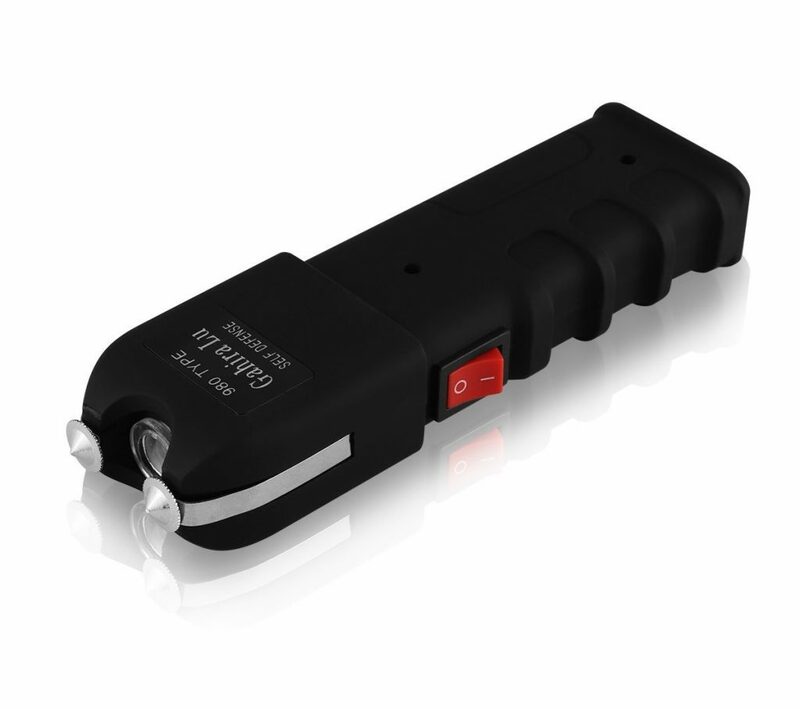 The safety switch protects you from harm as you carry the stun gun around. Don’t believe the hype. 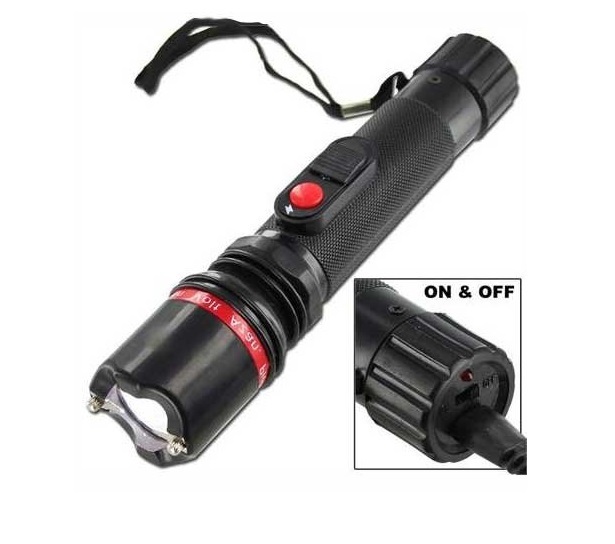 This 6.5″ x 2″ x 1″ stun gun will put out up to 30,000 volts of electricity into your attacker. Even if your attacker tries to grab the gun the metal side plates will zap him. Plus, the extra-sharp prongs will go through his or her clothes. You also get fingertip control over the power button and a no-slip grip. 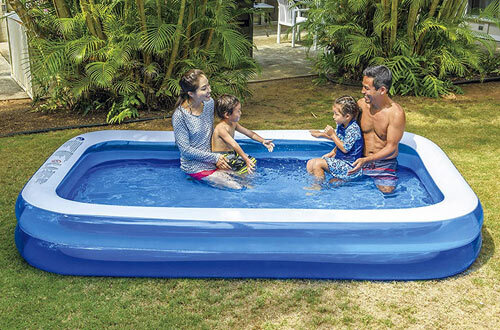 A built-in rechargeable battery powers the unit and it is easy to recharge. This 6 1/2” long stun gun comes with a belt clip, so you can keep your protection at your side. Not in your purse. It also has its own carrying case for added convenience. Its 400- lumen powered LED light comes with a3 settings. Low, bright and a strobe light for emergency use. Also, you get a safety on and off switch to protect yourself and children from any accidents. Its recharging cord is included and plugs into the standard electrical outlet. Get the drop on any would-be attacker with this 6 ¾” aluminum stun gun. 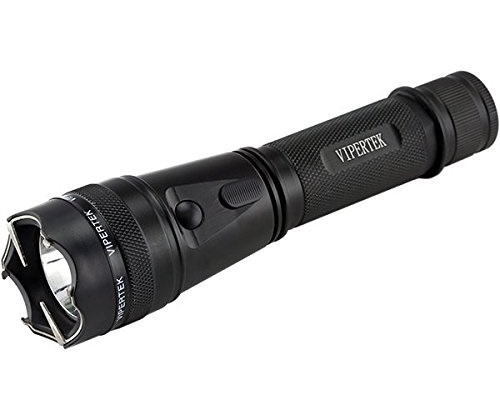 Its built-in battery powers the stun gun and the 400-lumen, 100,000-hour LED flashlight. All the power is at your thumb tip. Your thumb controls the on and off switch and power button. Its loud zapping sound is designed to make your attacker stop and think before they move. A built-in rechargeable battery brings all the power you need to protect yourself. 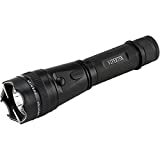 Having one of the top 10 best stun guns in 2019 in your purse sounds like a good idea. And it is if you know how to use it properly. You need to keep your fears and emotions down. 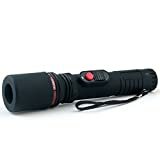 Using one of the top 10 best stun guns in 2019 is easy and they bring lots of power for you to use. 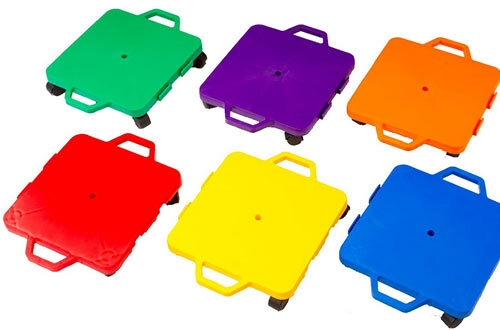 Just get a little training so you do not hurt yourself.